"I AM NOT PRETZEL WOMAN!!!" Have you ever uttered these words, or some similar to them? I have to confess that I have, and on more than one occasion. "Blessed are the flexible, for they will not be bent out of shape." Even though this is not one of Jesus' Beatitudes, there's still a lot of wisdom in these words. I have to admit, I'm not the greatest at being flexible. Part of the problem is human nature - we just don't like change. One of the reasons we don't like change is that we're terrible at predicting what we may or may not like, so it's safer just to keep things as is. I think another reason is busyness. It takes time to learn something new, to rearrange our schedule, to add just one more thing. This is the place where I find myself right now. I don't handle "busy" well, either physically or mentally, and the things I'm busy with now are not things I've chosen for myself. This makes me busy AND frustrated, because I don't have time to do the things I'd like to be doing. Trust me; this is not a good combination. When I'm on overload the last thing I want is change. This is why, when I was asked to change the date I would be giving the sermon at a campground worship service my first inclination was, "No." Not because I couldn't, but because I didn't feel I had the time to make the effort. God loves me and wants the best for me, even though it may not look like it at the moment. For the past three weekends, and the two weeks in between, we've been staffing two Parade Homes as a fundraiser for our trip to Kenya. This not only meant finding people to staff the homes for 6-8 shifts a week per house, but also making sure the houses were supplied with what they needed, balancing ticket sales and reporting in to the Home Builders Association daily. In addition to that I was also managing another time-consuming fundraiser. Then this past Saturday I hosted a bridal shower for my niece at my home in the afternoon and a cookout at our fire pit for the Parade volunteers in the evening. (I figured as long as I had my house clean, I may as well have both parties the same day.) Sunday we had the kids over for Father's Day. And when was I originally scheduled to give the sermon? Yesterday, after a crazy-busy jam-packed month. And what date did they ask me to switch to? Next Sunday, following a relatively quiet week (so far) with plenty of time for me to prepare. So, in the course of helping someone else out for some unknown reason, I was the one who benefitted big time! What a great reminder to help out others whenever possible. You never know; the one you're doing the favor for might just be you! For those of you who are interested, here's a look at the bridal shower I hosted this weekend. Be sure to scroll all the way down; I saved the best for last! 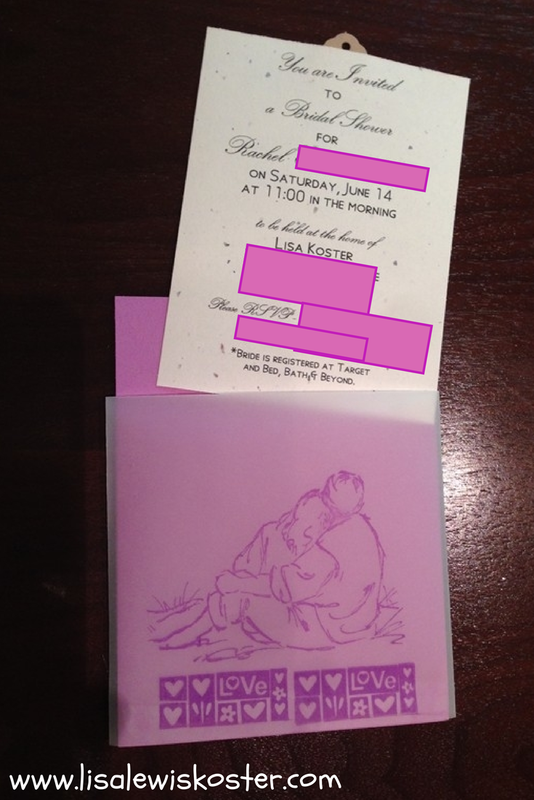 These sweet little invites fit in the standard 4x6 envelopes. The purple cardstock is just smaller than that, and wrapped around it making a pouch is a piece of vellum I stamped on and attached at the bottom and the back of the card. I put a tab on the invitation itself so the recipient would know to pull it out. On one side are the details of the gathering; on the other side are directions to my house. One of my favorite centerpiece ideas is to use floating candles in some vintage glass containers such as the cookie jar and loaf pan pictured below. These candles were an off-season clearance rack find. My gift for the bride-to-be doubled as the game. 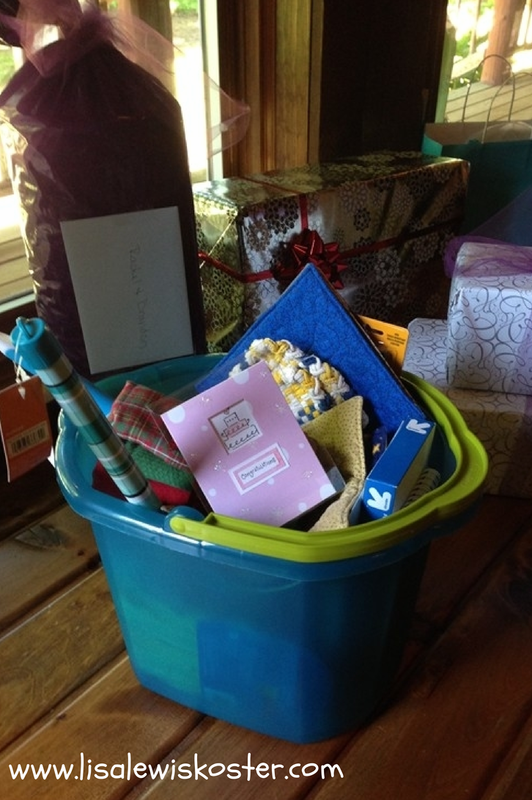 I filled this bucket up with random items ranging from a plunger (which the bride mistook for a paper towel holder!) to a mouse pad to envelopes. She announced each item as she took them out of the bucket, then after she put them back in everyone was asked to list as many of the items as they could remember. Here's a close-up of the enclosure card. 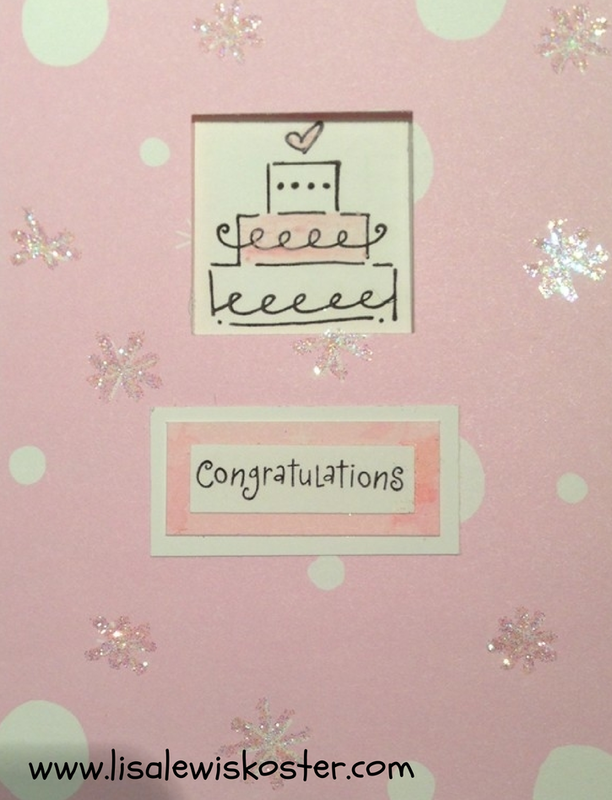 I punched a square out of the front of the card and stamped the image on the inside so it would show through. The bride is incorporating mason jars into her wedding reception decor, so I used some vintage jars to hold the silverware. Smaller, half-pint jars were utilized to hold fruit and yogurt parfaits. 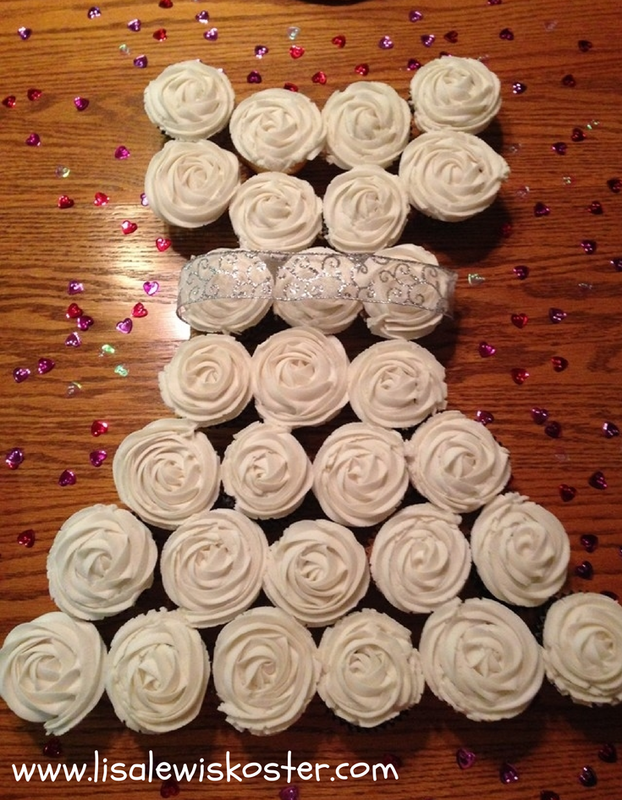 And here is my Wedding Dress "Cake" composed of swirled cupcakes. My friend Deb (aka the cake guru) instructed me to use a 1M tip for the icing. Not bad for an amateur as long as you don't look at the Pinterest pin I modeled it after :) The only thing I would do differently would be to use a heavier ribbon for the belt since this one is hard to see. 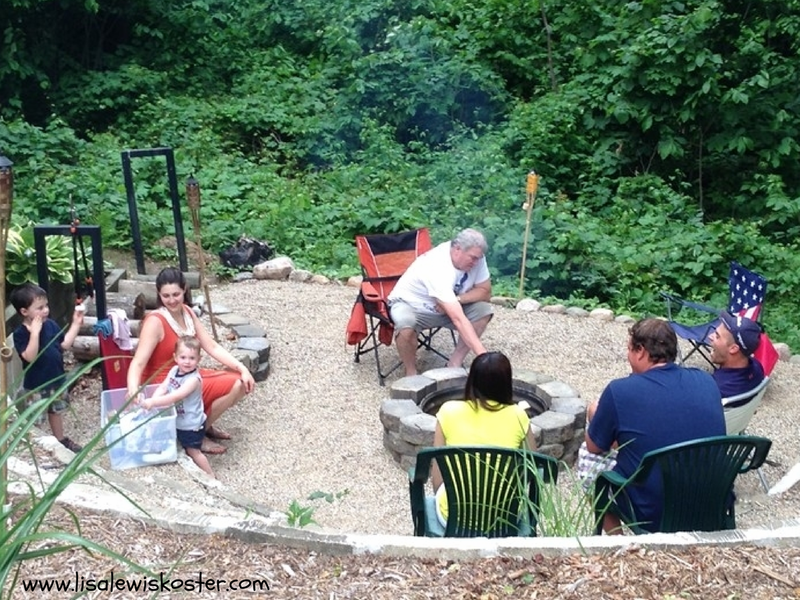 On Father's Day we enjoyed the fire pit we spent most of last summer making. You can see it step-by-step here. What a gift God gave you! A perfect example of why we need to be flexible and receptive to Him. We have no idea how His mercies are going to show up until later sometimes. It's all a matter of trust and not digging in our heels and wanting our own way. This is a great reminder. 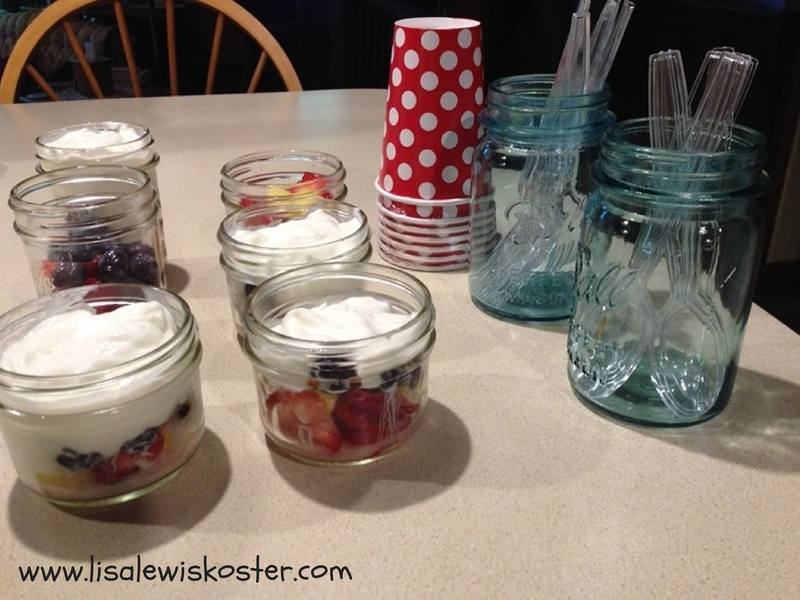 Love the mason jar parfaits. I'm a big fan of mason jars! And flexibility is so important. Just as important as boundaries. We could all benefit from reminders of where we need the balance. Blessings. When God asks us to be like clay in His hands, it is all because he want to bless us. he always has our best interest at heart. Great post! You described exactly how I felt in the spring. I wanted to do stuff for my family, and yet, I felt stuck doing stuff for other people because someone didn't honor their commitment and dropped the ball without any warning. Love the wedding dress cake! 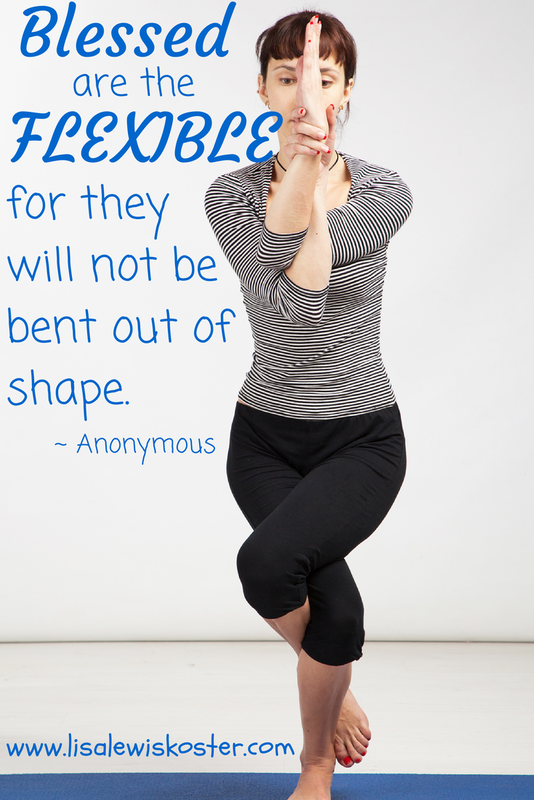 Great reminder on the importance of being flexible. Thanks for sharing! Great reminder! I think I'll have to write down that quote! :) Blessings! Great post! I would love it if you joined and contribute your awesome posts at my link party at City of Creative Dreams, starts on Fridays :D Hope to see you there at City of Creative Dreams Link Party. What a fun shower!! Wonderful. I need to remember to allow God to help me with the flexible. It will be the only way I will survive!! So creative! Thank you for sharing at The Weekend Brew! Thanks for sharing your experiences with being flexible. I know that change is hard sometimes. I can relate to that. Also having too much to do!! I love your fire pit and the decorations from the shower are very nice. 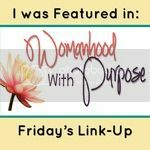 Wow, Lisa, I'm in awe of your schedule & abilities! And thanks for sharing the shower pics. How sweet! 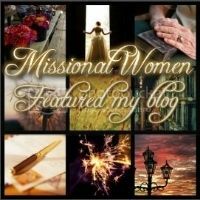 I appreciate your visit to my blog Doorkeeper last week. Thanks for your encouragement---both there & here. Blessings! Oh I can totally relate. It's hard when it feels like other people are dictating your schedule. When my mom lived with us, I would often find myself having to take her to a doctor's appointment or run her on an errand. She would sometimes forget to tell me, and suddenly my day was shot, lol!